The old comic character “Casper the friendly ghost” and the later show “Casper” as well as many other comical movies about the paranormal have subtly crepe into our society and helped form a false belief system of hell. We have made hell glamorous and light hearted. We have kept a mindset of hell as nothing more than a friendly club in the hereafter. White sheets draped over children with holes cute out for eyes and mouths running from door to door looking for candy just adds to the sweetening of a bitter deception. But the reality spoken of in the scripture is anything but light and fluffy. die without being sorry are eternally punished.” Yet, the reality of a devil’s hell is far from most peoples thinking and understanding. Even the church has avoided or at most has softened the message of hell. 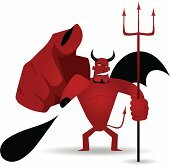 There’s a story of a president of a seminary who once heard two students out side his office flippantly joking about hell. He put his arms around them and took them to a window over looking the city and said softly “don’t joke about hell, people are going there… people are going there!